Maybe it is because in my last post I tried to make my (mostly northern hemisphere) readers jealous about the amount of sunlight Hawk (Steve Hawkinson) and I would be enjoying. But mostly it was probably because we went to a temperate rainforest and had some unusually rainy weather. Following is an account of the very wet and muddy week in the Cochamo valley, which included being stranded waiting for a flooded river to recede. Rolling out of bed and deciding I couldn’t skip coffee meant that I left Hawk waiting at the Santiago airport after his flight got in (sorry dude!). But hey, in the big picture, a half an hour isn’t that much, and in a way, it is somewhat miraculous that we both ended up there on the date that we set back in October. When we met up, we still had no idea what we’d be doing. I mentioned in my last post we decided to go “all in” and find one destination to aim for, to minimize hopping on and off buses and maximize time spent being somewhere (and I must say the gamble paid off). We spent that afternoon catching up, and it was soon apparent that my face-to-face conversation skills are lacking at the moment. Despite writing emails, Skyping with family, and reading websites in English on a regular basis, I’d often blank during a sentence because I’d forgotten a word. ”I just can’t talk English sometimes!” I actually exclaimed (potential future employers need not worry, I’m sure I’ll regain my fluency upon returning to the US). Add to that my propensity to mumble (what else would you expect from a bearded guy that has been wandering around mostly alone for the past year and a half? ), and it made for some moments of poor communication. Even walking down the sidewalk was an issue “Where are we going?” “I don’t know, I was following you!” Yet somehow we survived a week in the woods. 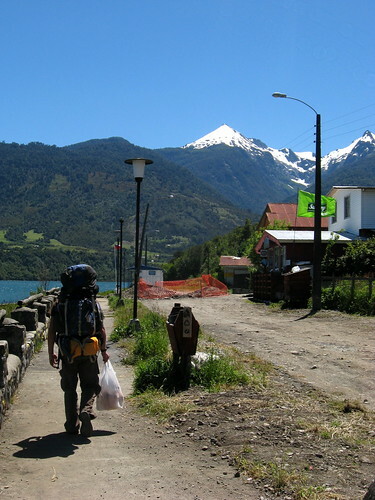 The guy that runs the hostel we were at told us about a trail in southern Chile, and after reading about it, we both were sold. Our bus didn’t leave until the next evening, so we spent the day in Santiago walking around and seeing some of the city. The smog got to my eyes and we both decided we’d be glad to be on our way soon. 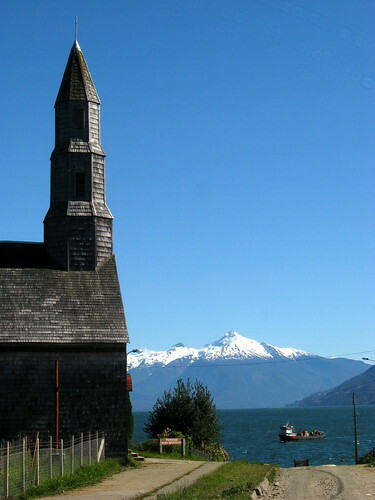 The overnight bus got us to Puerto Montt, one of the bigger cities in Chilean Patagonia. Despite having been to only one Alaskan coastal town (Hyder), we agreed that we felt like we were in an Alaskan coastal town. Also, having only been on the coast while in the tropics the past year, with sweltering heat, palm trees and hammocks a given, it was a unique feeling to be on the coast like this. On our way in there was a billboard ad for coloring for salmon “Good looking salmon sells better!!”. We made our way to the police station, as we were under the impression we needed paperwork done to leave the country over this particular border crossing (we didn’t). We also did the last of our shopping before getting on a local bus to the quiet town of Cochamo, located on a little ocean bay. The influence in the architecture from German settlers in the area is evident (I actually have no idea if this church looks German, but there were plenty of other buildings that did). We happened upon Hostal Maura, which seemed to be the only business open on a Sunday afternoon, and were glad to see they served dinner. Mauro and his wife run the place and he was quite helpful in telling us about the area, even though we were straightforward about not being in the market for a guided tour. We did however pay for a shuttle service to the trailhead, which is at least 5 miles from the town (after our interaction with friendly locals the coming week, I’m sure we could have easily hitched there too). Based on his friendliness and enthusiasm for the beauty and adventure to be found in the area, I’m sure the horseback rides and kayak trips he offers are top quality. 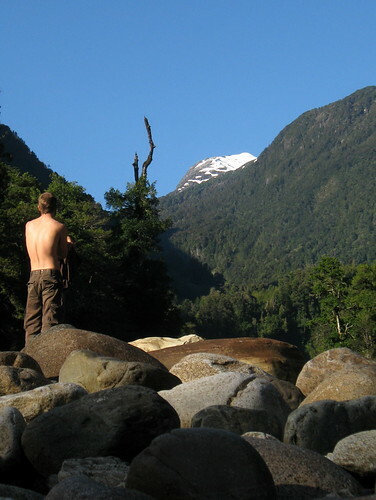 There is a plot of land near the trailhead that has basic camping spots and access to the Cochamo river. 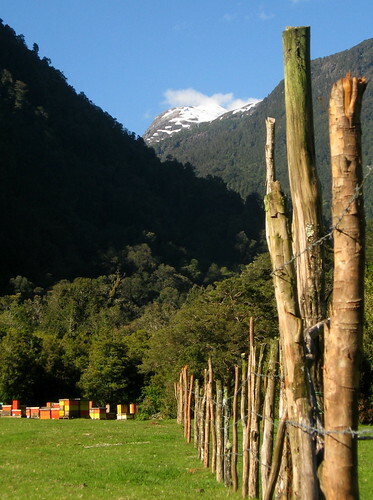 There were workers putting in the beehives for the season. We cooked up another meal there and didn’t bother putting up a tent, the sky was clear and no rain in sight. The next morning clouds had rolled in but still no rain. We had as a goal to get to La Junta, a little settlement near the river of the same name, where there are a couple of lodges open during the summer season (November to April). We soon found that this well worn trail that has been used by cattle ranchers and Jesuit priests for a century or two was very muddy at times. I had read a description that the trail had been worn down 10 feet in to the ground at places, and didn’t believe it until I saw it. Every year horses, cows and people dig up a layer of dirt which is then washed away. 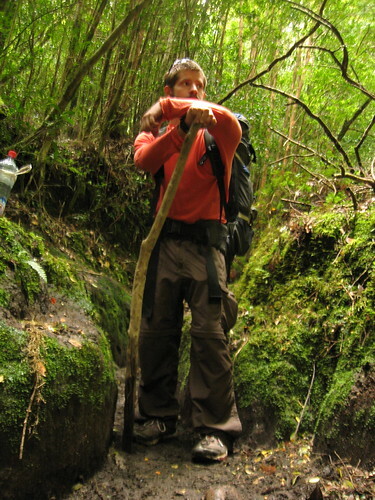 The ruts get deeper and deeper and soon you are walking in narrow meandering passageways. 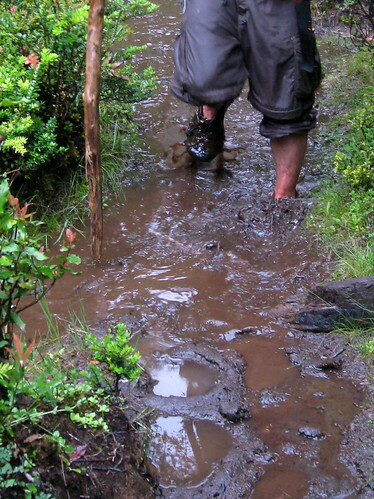 Other times the trail passed flat clearings which collected water and knee deep mud. But we couldn’t let this get to us! After all, we were in an amazing temperate rainforest, surrounded by trees covered in moss and vines. Aside from the trail, there was no evidence of humans (ie no garbage strewn about). 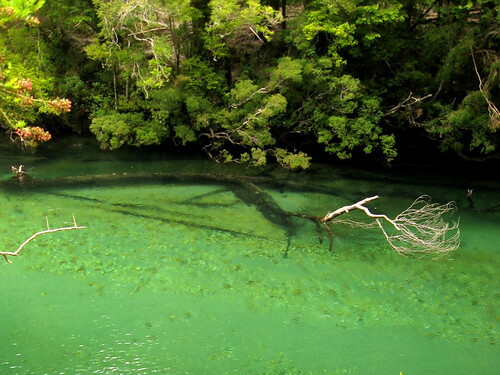 We found a spot by the river to eat lunch, despite being close to where the river flows into the ocean, the water was perfectly clear and you could the bottom of the river with amazing detail. If it were sunny and warm a dip would have been in order. At some point after lunch Hawk decided to wait for me to catch up (as he had been doing every so often), but somehow I had taken a split in the trail and ended up ahead of him. An couple hours later I got to La Junta without taking more than 5 minutes to sit down, and didn’t consider that I had overtaken him, so was a little irritated when I didn’t see him there or that he hadn’t stop to wait for me at all. The shelter and campsite at La Junta were an obvious meeting point, why had he kept going? It turns out that after waiting for me, he finally turned around and hiked back to where he had last seen me, then hiked all the way until he got to La Junta. Among some of the confusion is he didn’t know what was at La Junta (I hadn’t explained to him), he assumed it was just a rustic campsite when actually there was a shelter by the camping and a lodge across the river. Anyway, we were reunited and decided to work on our communication a little more, and stay within earshot of each other on the trail. 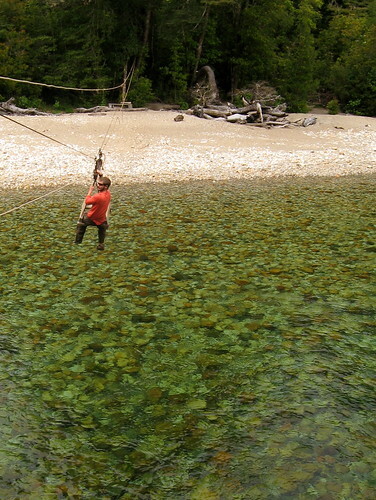 To cross the Cochamo River (camping is on the north side, the lodge on the south side), the folks at the Refugio have set up a zip line (forgive me if this is not the technical term for it) with a little cart and a pulley system to move back and forth. I had already done it once when I arrived to go see if Hawk was already at the lodge, and was happy to do it again. I generally don’t like heights, but I think it helped that you are suspended only a few feet above water. We didn’t spend much time at the lodge and headed back to the campsite to get dinner going as we wanted to get an early start the next morning. Well, it started raining that night, so we got up the next day and both agreed that maybe we’d rather hang out at La Junta and not hike in the rain. That we had been greeted by the friendly girls with beautiful smiles that work in the kitchen might have had something to do with our decision. We ate breakfast in the shelter, and Hawk spied some funny looking birds walking around just outside (can anyone help identify it?). 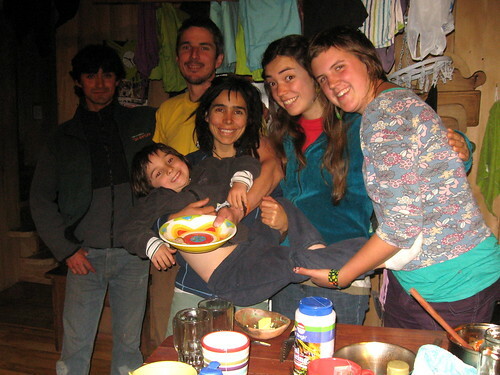 We headed back over the zipline and got to meet Daniel and Sylvina, the couple who own and run the Refugio Cochamo. Up until a few years ago they had a smaller, more rustic cabin across the river, but recently had built a really beautiful cabin (made from local timber and boards deftly made only with a chainsaw). 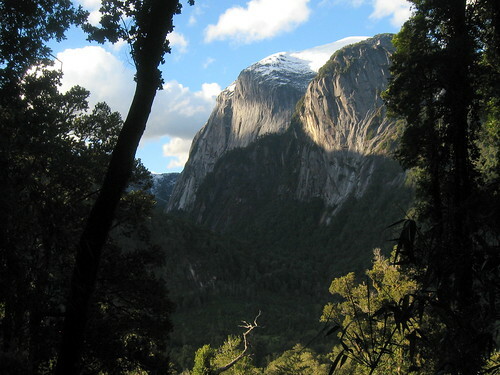 Daniel is from the US and Sylvina from Argentina, they met as rockclimbers, and after a trip to the Cochamo valley (known for its huge granite rock faces that make for great climbing), decided to buy some land there. Daniel warmly greeted us and told us that even though we were camping on the other side (and even if we had camped for free off their property), we were more than welcome to hang out in the Refugio. I’ve come across many haughty businesses on this trip that cater to wealthy tourists, poke my head in and think “This scrubby cyclist will probably not be appreciated here”, and go find somewhere else to hang out. So we unabashedly stuck around for the afternoon and evening, and never felt we were overstaying our welcome. We had a coffee break (break from what I couldn’t tell you) with some delicious Intelligentsia (roasters in Chicago) that I had asked my friend Cooper to send down. I’ve only come across coffee this good a few times by chance on this trip, so I savored it as best I could! It speaks of the local coffee culture here that the freshest coffee I’ve had was shipped from Central America to Chicago, roasted, and then sat in Hawk’s backpack for a week in Mexico before I enjoyed it. Coffee snobs would say that was a week too long to get to me, but it was still better than anything I’ve had since my lucky find in Peru. We also had the joy of hanging out with (/babysit) Daniel and Sylvina’s son Zen (short for Zenon), who is 5 (I think) and quite bilingual (Parents!!! If you have the chance, immerse your kid in a 2nd language either at home or at school), so it was great to speak in Spanglish. Besides running around playing chase with Zen, Hawk offered a very creative geography lesson. Ever inquisitive, Zen kept asking what state or country was next to the previous one (“And then? 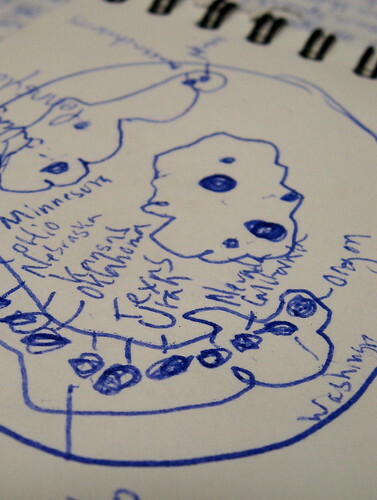 And then?”), so this is how the map ended up. My contribution was reading a story book and cutting out snowflakes. 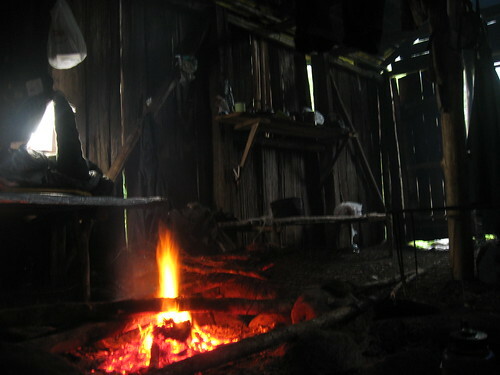 Since we hadn’t planned this day off, and had only brought in so much of our own food, we decided to spring for one of their delicious meals cooked on the wood-burning stove. Not cheap by a frugal backpacker’s standards, but a pretty good deal considering the quality, quantity, and the fact that everything is brought in by foot and made from scratch (Sylvina has a garden that should provide some produce later this season). We also split a refrigerated beer, one of the first for La Junta. Daniel had hiked up the trail with a refrigerator on his back (!) and had just got it up and running that afternoon. A small turbine installed a ways up a river that runs behind the cabin is enough for a few small appliances in the cabin. Though we thoroughly enjoyed hanging out with Daniel, Sylivina, Zen, and Martina and Celeste, we said goodbye as we had decided to leave the next morning, rain or shine, and went back to the campsite. We were up and on our way the next morning, and first thing was to cross La Junta river. 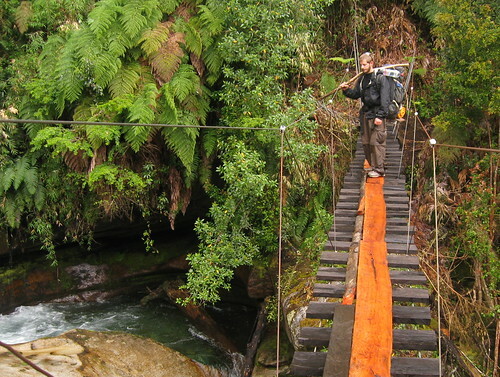 We could have forded it, but it was cloudy and cold, so we decided to hike upstream to where there is a bridge. At some point we went up the wrong trail and ended up having to backtrack, which set us back an hour or so. But whatever! We kept on for several hours, through lots of mud. 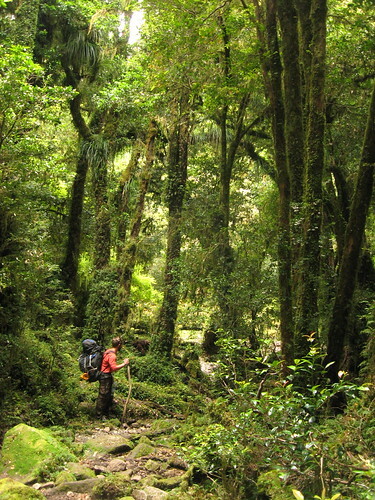 At some point we realized we had been hiking up a valley and were a ways from the Cochamo river. I was under the impression that we’d follow it most of the way to get to El Arco by the end of the day, where there was a shelter. We took our bags off and walked down the trail a few minutes, and could see nothing more than a bunch of more mud. Having doubts if we were on the right trail (we were), being cold and wet from the drizzle all day, and knowing we still had the two toughest days ahead of us on the way to Argentina, meant we decided to turn around and make our way back to La Junta. We wouldn’t achieve our goal of making it to the border, but decided that going further might put us at risk of getting lost with not a lot of food, and we didn’t want to risk that. So, we backtracked for three hours and made it to El Traidor river, where earlier that morning we had stopped for lunch. We only had a few hours to go to La Junta and figured we’d make it back there the next morning and do some hiking around there. So we set up our tent in a clearing on the east side of the river. That night the rain started coming down hard. Early in the morning Hawk muttered “Don’t know if we’ll be able to cross the river”. ”Whatever, because that would mean we’re stuck here, that can’t happen” I told myself, and ignored what I thought sounded like heavy rocks being dragged down the river. Hoping the rain might stop sometime soon, and exhausted from the long hike the day before, we decided to just sleep in some more. But the rain didn’t stop, and the tent started to get really soggy. We considered our options. One was to hike upstream until we found somewhere narrow enough to cross, but that might take many hours, especially if there wasn’t a trail to follow. 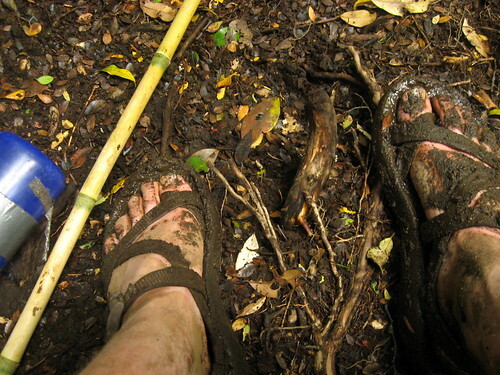 The thought of bushwhacking in the pouring rain seemed not only no fun, but also dangerous with the risk of hypothermia. The evening before, we had spied a little cabin at the other end of the clearing, but had not explored it as we were set on getting dinner made and to get bed as soon as we could. I seemed to remember it not having a lock on it, so suggested we might go take shelter there. We were worried about two things though. Surely the owner of it would show up and wouldn’t take a liking to us squatting there. Surely the place was mouse infested and we’d catch hanta virus. But then we looked under our sleeping pads and saw the rain had begun to seep in, we decided we really didn’t have an option. Before we had left the tent Hawk had already declared we were on rations. We really only had a day’s worth of food left (which we were planning on using from El Arco to Lake Vidal where a few families live and would be able to get basic goods and a meal), plus some odds and ends of snacks. So I ate two pieces of bread with some jelly, and Hawk, with more self restraint, just one piece. Also, no coffee, as we were couped up in the tent and couldn’t use the stove. We packed up and moved our bags over to the cabin and found a note that basically said “Clean up after yourself”. This and the presence of odds and ends of clothes and food left behind by others gave us the feeling that this place was used as a temporary shelter and we shouldn’t be too worried staying here. Still not resigned to staying here, we discussed our pretty limited options again and quickly decided we were best off focusing on staying warm and dry (it was in the 40′s), and that venturing out with limited food and a leaky tent didn’t make sense when we had a roof over our heads. The cabin was pretty big, on one end a fire pit with a bench/bed on either side. The other end had some branches left behind by previous guests to dry, and a shelf with some cookware. We rolled out our bags and we (or at least I) began our hibernation. I had become pretty anxious over the prospect of surviving on little food for who knows how long, so decided I should just lie there and use as little calories as possible. Now, I’m pretty laid back and could spend a several days in a cabin if I had to, but not knowing when the rain would stop and if the river would ever go down had me in a pretty mopey state. So I just laid there for most of the afternoon, and surprisingly, Hawk did as well for hours on end (Hawk is not known for sitting still!). We were still damp, and it was quite cold, so we decided to start a little fire and cook some dinner (I think lunch was a handful of peanuts). When we had moved into the cabin I had spotted what looked like a potato plant in the corner. Turns out there were 5 good potatoes growing under there (I saved some eyes and threw them in the same corner, hopefully in a few months more will grow again for the next stranded hikers). So for dinner that night we ate rather well. A potato chowder of sorts, made with some chopped onions, some bullion, and a bunch of powdered milk. So spirits were raised after this meal, but not too much, as the rain kept on going and going. Our plan was to set the alarm to leave early if the rain stopped in the night. We woke up the next morning, the rain hadn’t let up, and Hawk checked the river again. 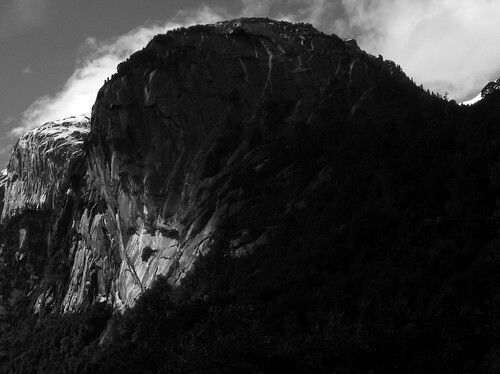 The huge rock peaks had sprung waterfalls, dozens of them falling hundreds of feet, and the snow line had moved down quite a ways. That is all to say it was still wet and even colder than the day before, we decided once again that we were safer inside, despite not having much food. I think we skipped breakfast (I NEVER skip breakfast), and just lay there for more hours until lunch where we split an apple with peanut butter. Late that afternoon we felt the rain was letting up. One good sign was the big puddle outside the doorstep had soaked into the ground. The river was still impassable but we had hope that the rain would hold off. After several attempts by Hawk to get me out of bed, to which I responded I was dry and warm in my sleeping bag thank you, I finally got up and went outside and was struck by the beauty of the cliffs which we could catch glimpses of as the clouds rolled along. It was still drizzling, but we were sure the worst was over, and decided we’d get ready to leave the next morning. I think I was in a considerably better mood that night, but tried to remain cautiously optimistic about the weather. A few bursts of rain that night, but in the morning, the river was back down to a passable level, and we packed up, eager to get back to La Junta and the warmth of the Refugio. It was now Saturday, and we had last seen the folks at La Junta on Tuesday, so they were a little surprised to see us. 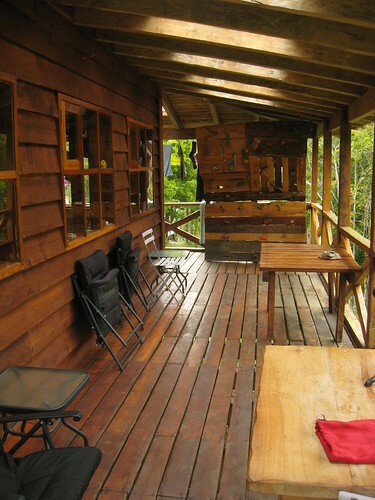 They mentioned that the Cochamo river was the highest they’ve seen and that the cabin we’d taken refuge in had been used by others who got stranded in the past. We told them about what lead us to turn around but confirmed that we were on the right path. Despite this, maybe it was a mixed blessing we had turned around and gotten to the cabin in time for the 48 hours of rain, as opposed to El Arco where we would have had a long and tough day in the rain to get to Lake Vidal. 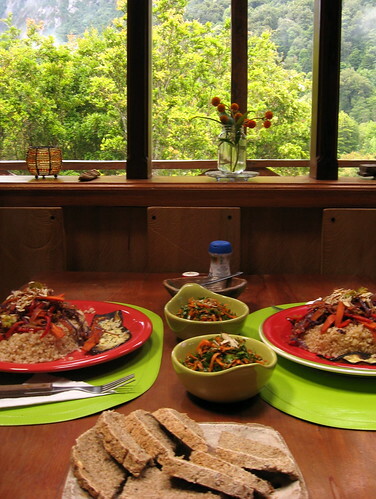 So we sat around the lodge for the afternoon, warming up, and eating freely. Much to Hawk’s behest, at about 5:30 I jumped up and declared we should go on a hike. I figured we only had a few more hours in the valley, we already spent enough time inside. The sun was making some appearances, and the blue sky behind the cliffs had me wanting to get some pictures. 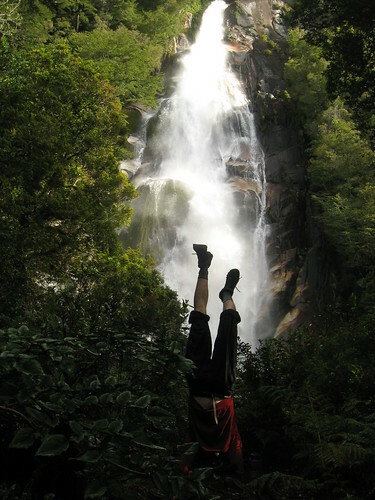 So we went on the “Circuito Cascada”, a loop which takes you by some incredible waterfalls. We did manage to loose the trail once, but this seemed par for the course for us. The views of the cliffs were absolutely stunning (I wish I knew the names of the peaks). After three nights in the cold and wet, we decided to spring for a spot in the bunkhouse in the lodge (which included a hot shower and breakfast in the morning). So we got to hang out more with the Refugio gang, ever the friendliest bunch, and talk to them and learn a little more about life here. 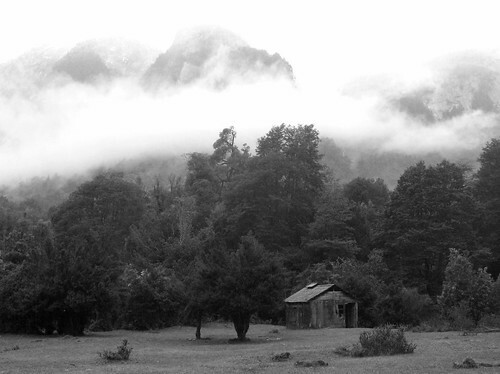 If I’m able to, I’d like to spend a few more days in Cochamo on this trip (or come back again some other time). There are a few places I’ve come across on this trip that I’d seriously like to come back to, and Cochamo Valley and La Junta is one of them. The other places all share the same qualities of people that live simple lives, like to grow and cook good food, and build their own houses. Sunday we left late and hiked back down the valley. Exactly a week before that we had arrived there, not knowing what was in store for us, but quite satisfied with the trouble we had gotten ourselves into and the trouble we had managed to stay out of. We hiked as fast as we could along the road, one last push as we were cutting it close with the last bus into town, but some some nice folks from Cochamo gave us a ride the last few miles, where we took the bus to Puerto Varas (slightly north of Puerto Montt), found a hostel and made a feast. It is a trendy little town, and we spent the next day eating and walking around and getting sunburned. That night we got back on a bus and arrived in Santiago the next morning. After lunch, Hawk dropped me off at the bus station and I made it to Mendoza, Argentina that evening. I rested up for two nights there (more from the bus ride than the hiking), and took another overnight bus to Salta, and picked my bike up. I’ll spend a couple days here getting the bike back in shape for a last push to Ushuaia, the end of the continent. Didn’t know that about Mexico’s national bird, I guess most would assume it is the eagle, found holding a snake in its mouth on the crest of the Mexican flag. Interesting that their habitat extends to way south in Chile. I’m sure I omitted many colorful details, hopefully he’ll fill you in. He did a pretty good job himself of keeping us alive “We need to regularly check on each other for signs of fatigue and hypothermia”. 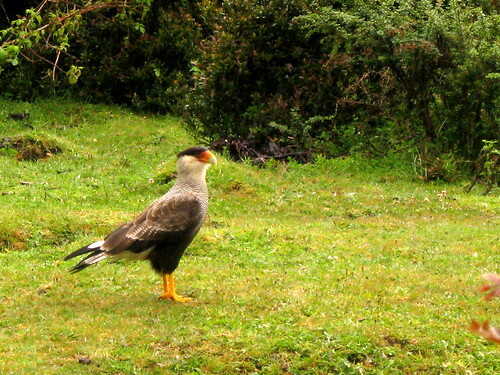 PS: The bird you’re searching for is a Crested Caracara! When I heard Hawk was coming down to meet you, I just knew you were going to have some stories. Not about being stranded though. Good stuff, man. Glad you and the Hawk are alright. Excellent! I loved reading the play by play of your trip complete with incredible photos! It looks (and sounds) like a beautiful and good trip even though it rained so much. Matt, Quite the adventure. Greg is buying hiking shoes in Santiago. Soon you will be biking and hiking together again, I think. Enjoy the Holidays and thanks for sharing your adventures. 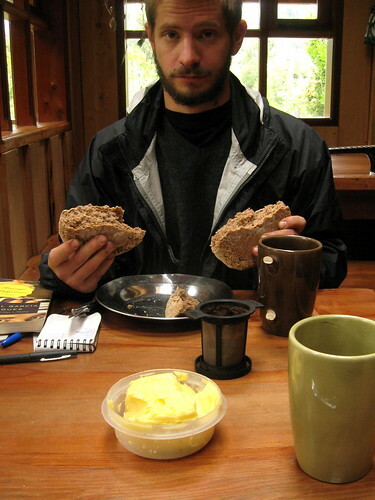 STUCK IN A CABIN WITH NO FOOD FOR DAYS ON END?!?! Heavens to Muratroid, you boys better take care of yourself!! Glad to hear y’all travel with peanut butter. I can hardly believe you are already on your last leg. Wow and Double Wow. Gorgeous photos, as always. It looks like you are wondering through never Never land! Great side-trip to your bike adventure. Looked like a sunny start, but then a lot of rain and mud. Incredible photos and landscape there, the stuff of legends. BTW: I’m no expert in church architecture, but I think the one you’re showing is not German – perhaps a Norwegian stave church? Keep up the spirit and make your way down safely to Ushuaia. Argentina is a big country and getting all the way down there before fall will set in will take some good effort.